Dr. Dass is a board-certified radiation oncologist at SFRO and has practiced in Palm Beach County, Florida, since 1993. He completed his bachelor’s degree at the University of Illinois. He is a graduate of the Loyola University Stritch School of Medicine and is an alumnus of the Cleveland Clinic Foundation, where he was instrumental in the development of stereotactic radiosurgery. In addition, he augmented his studies with extensive work at the National Cancer Institute and the Children’s Hospital of Philadelphia. 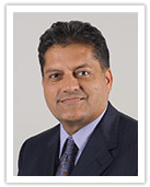 Dr. Dass was selected by his peers as one of the “Best Physicians in South Florida” by Miami Metro Magazine in 2000. He is a member of the American Cancer Society, the American College of Radiology and the American Brachytherapy Society. Dr Dass has performed more than 3,000 radioactive seed implantations to treat prostate cancer since 1993. More than 80 percent of those treated patients have had no evidence of cancer after treatment.